From all points on Renaissance Island, tolling bells can be heard. 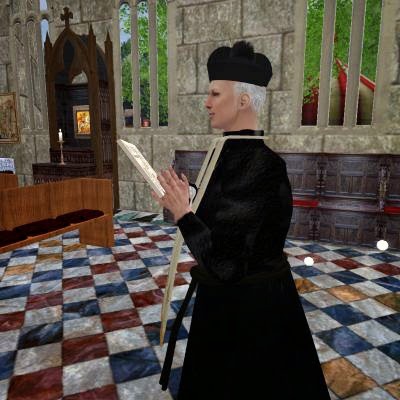 It is Sunday, and they are a call to worship at St. Minutia’s Church. Vicar Torrelle greets parishioners at the doors of the quaint, medieval church, and Martin Luther’s Protestant anthem, “A Mighty Fortress is Our God,” is accompanied by the crowing of a nearby farmyard rooster. 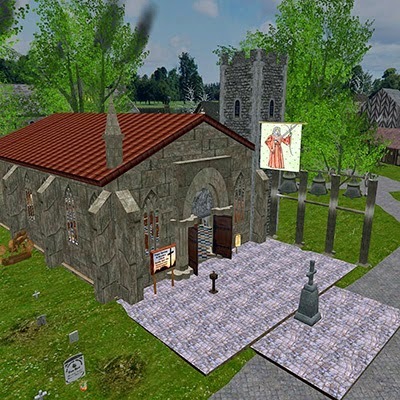 Places of worship in Second Life are sometimes historical re-creations and sometimes purposeful sanctuaries. St. Minutia’s Church is both. Picturesque and devoted to the history of an age, Renaissance Island was established in 2007. 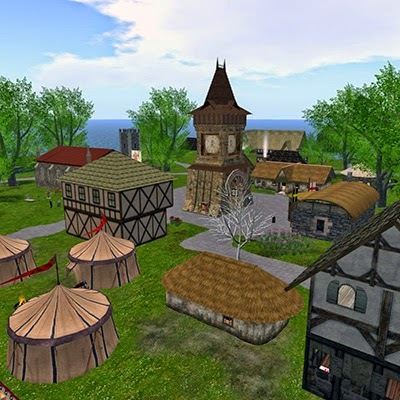 This sim is home to the Globe Theatre, features jousting tournaments, and is a favorite networking spot for RL library science students. According to the estate’s owner, Lady Korrigan Keynes, St. Minutia’s Church was one of the first buildings in the parish. But services at St. Minutia’s are more recent. 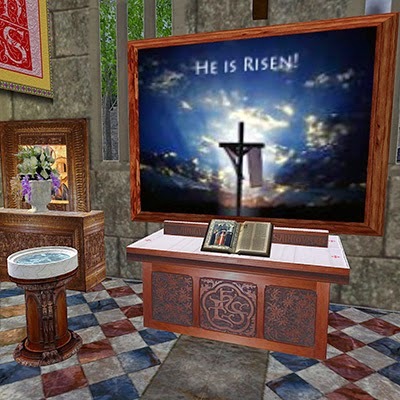 Vicar Torelle began holding services at the church “in time for Easter” this year. Sunday services are at 1 p.m. SLT each week and are usually between 15 and 30 minutes long. The warm glow from within the church makes it a perfect setting for weddings and baptisms as well. “Which was during the time when Henry VIII wedded Anne Boleyn,” said Lady Amza Hydraconis, co-estate manager of Renaissance Island. 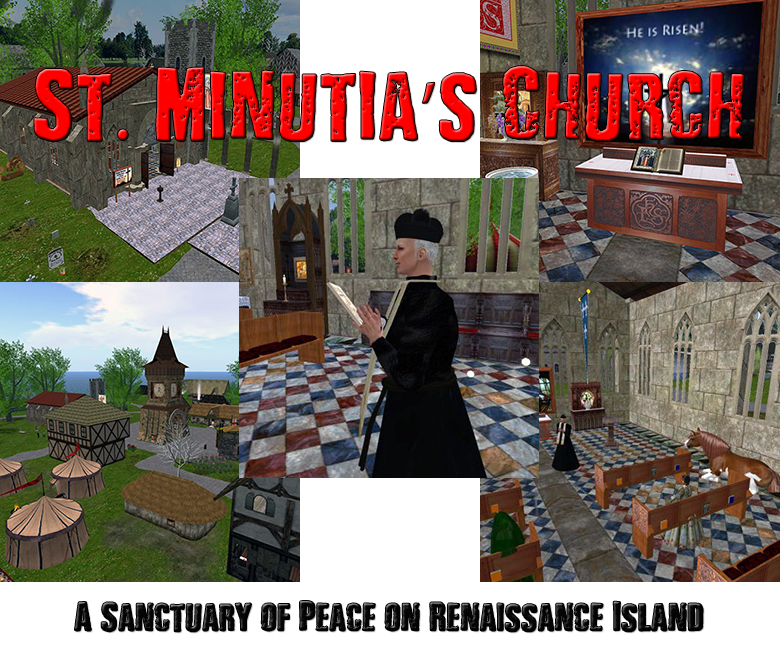 For more information about St. Minutia’s Church, Renaissance Island, or to book a wedding, reception, or baptism at St. Minutia’s, contact Amza Hydraconis or PrinceJ3rd Figaro.